Being a bit of a chocoholic, I just had to try this one out - and the $6.88 price tag didn't hurt either. Yep, that's right, you get 172 ml worth of product for less than $7. I am a fan of cleansing foams, I like the way they lather up, and I like the sensation of a thorough cleanse, which most foaming cleansers will do. But having dryer skin of late, I thought such cleansers would end up drying my skin out further. But no worries, this Chocolate Latte version is specifically catered for dry skin types - I think it has to do with the milk ingredients, as milk is supposedly very good for softening and moisturising skin. I really like the packaging. It's a clean white squeeze tube, and it has the most lovely presentation with a gold swirly border, and even a cute little tea cup illustration. 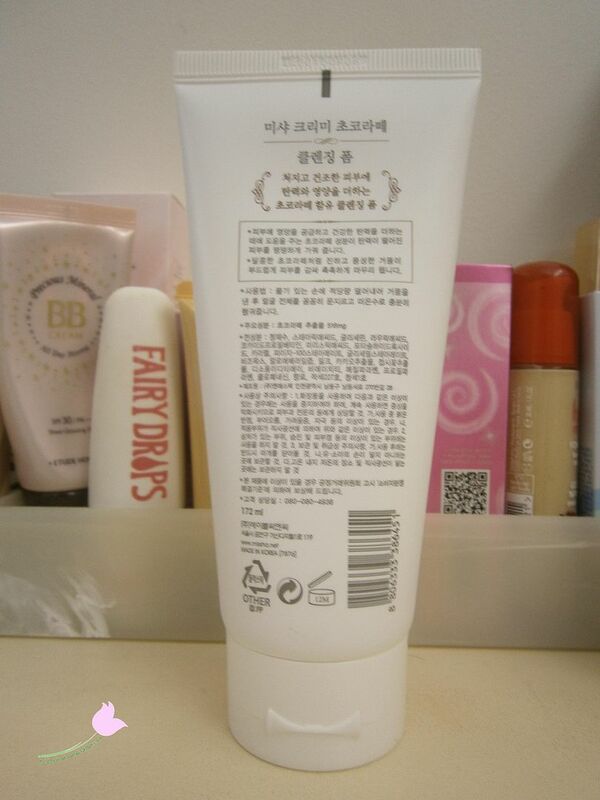 Everything is written in English on the front, but on the back everything is in Korean. 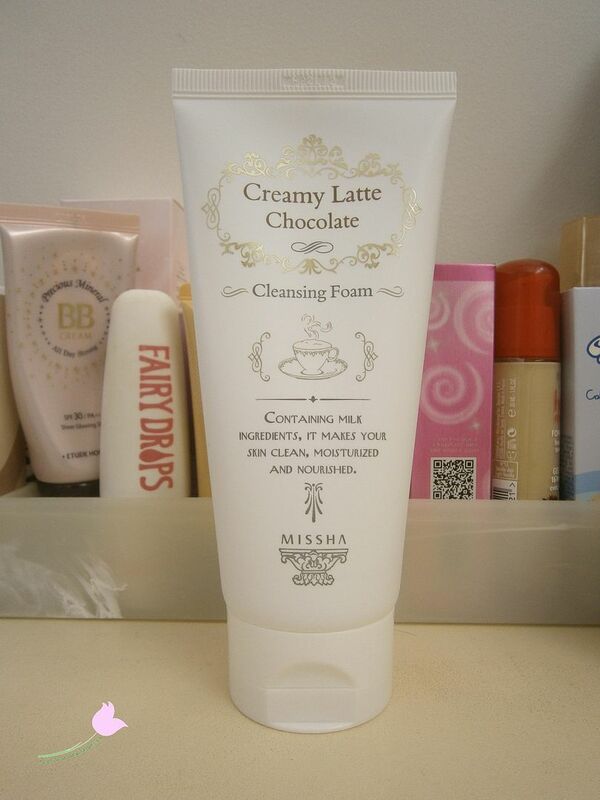 It's a little surprising considering MISSHA has quite an international market nowadays. I would've liked to be able to read the ingredients list, in particular. Notable details: MISSHA stamps their products with the manufacturing date, and not the expiration date (many Korean brands do this). So don't be alarmed and think you have an expired product if you buy this online. This cleanser is good for up to 12 months after the opening date. 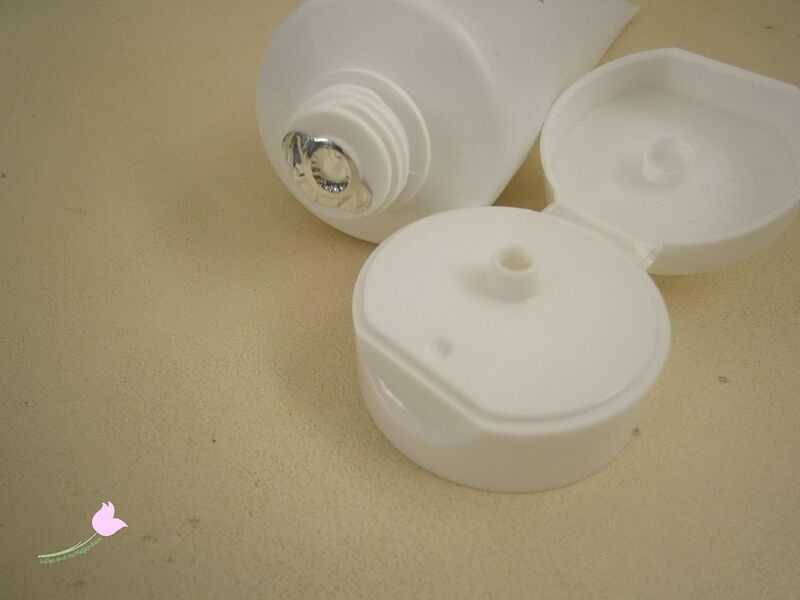 Here is how the product is dispensed - with a flip lid, and nozzle. The cleanser should come with a foil seal, to show that is a brand new, and a non-tampered product. The texture is very thick, it'll pretty much stay in place, even if you wave your hand around a bit. I must mention the scent too, it does indeed smell like chocolate latte! If you are not a fan of fragrance products, than this may not appeal to you, but I think chocoholics will like this! I could detect a slight scent lingering on my face in the immediate minutes after rinsing it off, but it disappears soon after that. And a little will go a long way, as it does lather up very well. With 172 ml worth of product, this cleanser will take a long time to finish too. I don't find this drying at all, I feel like it thoroughly and effectively cleanses my skin, and it doesn't make my skin feel tight or dry after using this. The one little thing I do not like so much is that squeaky clean feel I get immediately after rinsing off. It doesn't last too long though, so it's bearable. so cheap, especially considering the size! I purchased this for under $7 at Cosmetic Love, but this is also easily available on ebay with similar prices. And there are also two other variants in this Cream Latte Range - Strawberry (to brighten normal skin), and Green Tea (to cleanse Oily skin). Definitely worth checking out if you're on the lookout for a new foam cleanser to try - as long as you don't mind scented cleansers, or a squeaky clean skin sensation afterwards. Are you a fan of dessert/sweet themed beauty products? yeayy! I think I'll buy this. wow I have never heard of this one before!! I am quite loyal to my clarins facial foam, but this one looks so cute!! and chocolate smell? OMG who doesnt love chocolate?? thanks for the review! For $7? Good looks. I really like how it looks its name, "Creamy Latte Chocolate". Haha, adding this to my wish list. Hopefully it won't cause me to breakout! Ooh, sounds really cute though! It's good you're loyal to one cleanser, I'm still on the hunt for the perfect one! 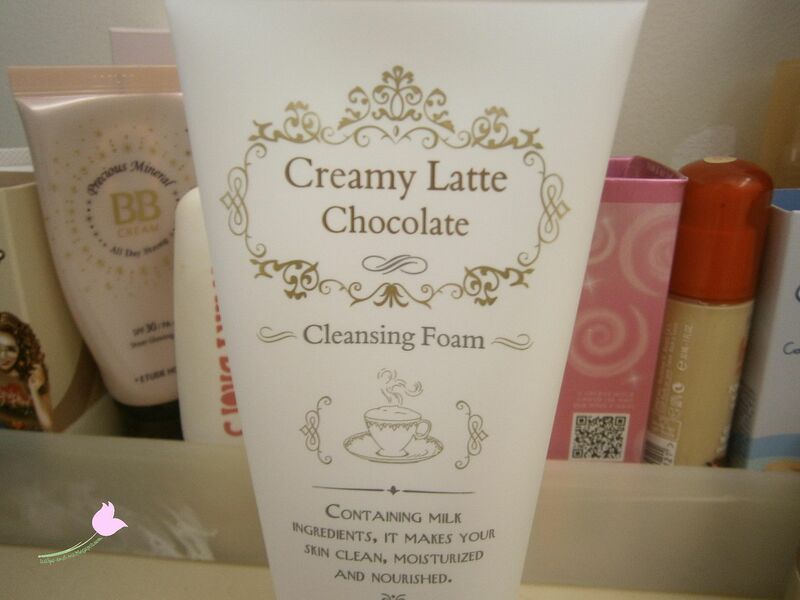 Haha, it's definitely a cleanser for chocaholics! Thanks! Ooh, the strawberry latte one sounds nice~! Cosmetic Love must be my fave online site for Korean goodies! I've never had a problem with them, and have been buying from them for about a year now - they give a lot of samples too. I'm the same with skincare and makeup, if it smells like food or has a food name that I like, I generally will buy it lol I don't think I've ever tried any MISSHA product before :3 But I've heard so many great things about them. Are you a fan of dessert/sweet themed beauty products? Most definitely! I love all of these scents that they come out with! The product looks so pretty too, all shiny, haha. The green tea variant sounds so nice and soothing! It is recommended for daily use? I used mine daily, and it was fine, but I always moisturised afterwards as foaming cleansers can be a bit stripping. I actually found it quite good for removing most bb cream (not all of it), though I usually try to use a make-up remover first. Hope this helps!